Welcome to Shimosagaya. Located in the mountain village of Tsumago, this Minshuku provides relaxation and comfort amid the beautiful surroundings of the Kiso Valley. Guests are also served home-style cuisine, fresh seasonal vegetables and river fish in Shimosagaya's dining area. Good to know: Shimosagaya is an old, simple and traditional building, it hasn't been renovated like other ryokans in the area; so do not except something really clean or modern; it's part of its charm. At Shimosagaya, the air conditioner and TV are coins activated (100 yen per hour). Please understand that this is a small family business, so the level of service will not be the same than in a standard western style hotel. In this ryokan all rooms are small private rooms (6 tatami mats sized room). We chose this accomodation as it had the least bad reviews out of a list of options with bad reviews. I'm affraid I'm going to have to add to that. This was way overpriced and not very authentic despite the beautiful location. The house was also not the cleanest and I'm certain the bedding isn't washed between guests (hair in the bedding being a good clue to this). The hosts were lovely, the location fantastic and the experience was interesting but not nearly as nice on any front when compared to other Ryokans/Minshukus (not sure this can be called a Ryokan really?) that we stayed at. Once in Tsumago we felt there really were better options in the little town. Family run, this modern family home was pleasant! Run by the "father" who was firm that I could not wear my own clean indoor slippers, he was a good host although we were unable to communicate too much. Food good, carefully prepared. Shared bathrooms functional and adequate. Stairs were steep and older people would need help moving baggage up and down! A wonderful 2 nights stay with beautiful smiling hosts. The mixed reviews of this place are totally unwarranted. If you want hotel like amenities, then stay in a hotel. This is a wonderful family run Minshuku and it felt like staying in someone’s home. Spotlessly clean and a truly local experience. The dinner and breakfast were delightful and varied with local delicacies on offer. Bath was delightful if you follow house rules open from 4pm until 9pm. Shower first then the bath water stays clean... sinks and toilets on each floor for morning freshen ups...go local and you will enjoy this wonderful place. Gas heating is provided for free or you can use split system for 100 yen per hour but in a small room only need a small amount of heating. Clean sheet for futon and fresh full size and Onsen towels provided. Tea and sweets were a nice touch in the traditional tatami room. I would definitely go back. Steep steps to 2nd floor but small cases are no problem. A more than adequate and beautiful place to say when hiking on the Nakasendo Way. Thank you. This was the only option for my partner and I, everywhere else was booked out. I witnessed the staff put the futon beds back into the cupboards without changing the sheets. The sheets they do give you are rough, smelly, and very tiny. The same goes for the towels- they are the size of a face towel. The Onsen is a small luke warm bathtub that neither of us could fit into, it wasn't very clean either. The hallways in the Ryokan were freezing cold. They don't provide slippers like at other ryokans, and when I wore my indoor slippers because the floors were cold, the Ryokan staff yelled at me. They do provide a heater for the room but it is a gas heater, which makes the room smell like gas, and is a bit of a worry health wise to be in a tiny room all night with it. The staff hide away from you, which was not our experience at other ryokans. The food was served cold and is only so-so, nothing like the experience at other ryokans. The hike the next day was lovely. Overall, the ryokan was very expensive and not worth staying at for the price. If the stay had been the cost of a hostel, it would have been more inline with what it's worth. We had a lovely stay. Facilities were rather basic for the price you are paying. Traditional dinner and breakfast was ok. Friendly hosts although interaction is limited as they don’t speak English. This ryokan has a great location in heart of Tsumago, with easy taxi access from Nagiso Station (JR train). Great Japanese food. For adventurous eaters, the sweet crickets were delicious. Staff was friendly, but speaks limited English (which was expected as part of our cultural submersion). The futon beds were way too hard for our preference, as is common with Japanese style rooms experienced several times during our month in Japan. Hard futons were okay for 1 night of cultural submersion, but we found in hindsight that western style hotels with chairs and soft beds in the bedroom were much preferable to Japanese style rooms with hard futons and no chairs (just a low sitting pillow). Futons at some other places where we stayed in Japan were softer than found at this ryokan. We had a lovely stay at Shimosagaya. We had a great room with a view of the river. Received a warm welcome on early arrival, and were able to access room early. The dinner and breakfast were great. A real family and local atmosphere. Bathroom facilities great and clean. Thank you for a great stay. After reading a bunch of mixed reviews I didn't know what to expect, but I'm so glad I decided to book this place because it was beautiful!! The hosts were extremely lovely, never a moment when they weren't smiling at us. The food was great and we found the bathroom facilities to be equally amazing! The room was nice and clean, sleeping with the windows open to hear the river outside was very relaxing. We would definitely stay here again, great service, great food and great atmosphere. Only word of warning for those with large luggage the steps to the rooms are quite steep. My partner managed just fine but I probably wouldn't have been able to carry my suitcase up myself! Lovely stay though, I recommend 100%. This was a lovely ryokan in a great location. Our room was large but the walls were paper thin. This wasn't something that we noticed in other ryokans. Our room looked like it had been very recently renovated. The bathroom was only available for hot showers at night and you had pay for AC. We had special food requests and these were overlooked. I probably should have checked when we arrived. Overall, it was a comfortable stay. Tsumago was the highlight of our trip to Japan and Shimosagaya was a delightful place to stay. 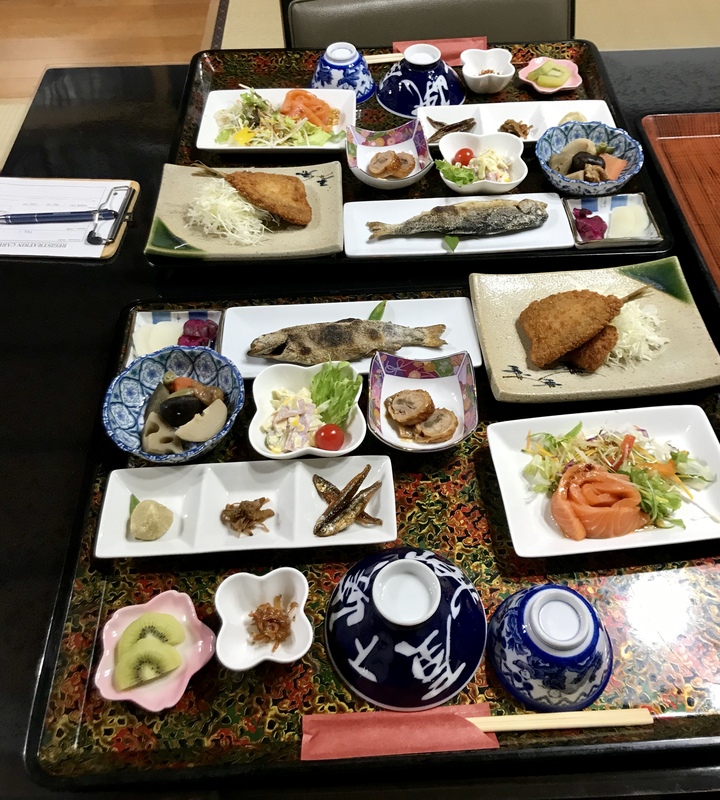 Food was excellent, rooms very clean, location in town ideal, and overall a unique experience of life in traditional Japanese style. Host was reserved but very helpful and friendly. Overall great value for money. Highly recommend it. We loved our stay at this adorable minshuku after our amazing hike from Magome. It was pouring rain the day of our hike but it was wonderful exploring this area of Japan and the small town of Tsumago. Our room opened up to the balcony and we enjoyed sitting on the deck watching the rain. The food was excellent. Very clean and comfortable. We highly recommend this minshuku! Thank you for your hospitality. The sign posting can be missed if not looking out for it. It’s located down an alleyway where the road divides. Our introduction to the place was professional and concise. The stairs are steep, so minimal luggage is advised. Food: average compared to other minshukus. We did try fried locusts, which were a novelty for the kids. Rooms: very clean. Lovely outlook from our room. Bathrooms/toilets: only 1, so there is a wait to use amongst guests. No hand towels supplied at washbasins, so bring your own. They clear out the bedding/towels, etc as soon as you’re up for breakfast. Shimosagaya was a great way to experience a traditional ryokan and also a nice starting point for our hike to Magome. Tsumago is the smaller of the two towns, allowing a quiet tourist-free walk in the evening and early morning. Our room was comfortably sized for a couple. It was in the traditional style with tatami floors and futon bedding. Our hosts were polite, and the food was quite good - a nice mix of different types of food, so that if you didn't like one item there were many others to try. If you are looking to stay in a Ryokan in the Kiso Valley we recommend Shimosagaya. Muy buena experiencia. Realmente es un pueblo de ensueño. Comida correcta pero no destacada. Te reciben con te y dulces. Baño pequeño para la cantidad de huespedes. Great location in a lovely village. This ryokan has nice rooms, good food but bathroom is small, everything from aircon to beer is expensive and family were not overly hospitable. Only fair value. As others have pointed out, this minshuku has coin operated TVs and air conditioning, which is something we didn't notice at other places. Also, when we were called down for dinner, we saw the proprietor check other people's bedrooms to make sure the lights were switched off. After breakfast the proprietor cleared away the futons, but we noticed that they had simply returned them to the cupboard, sheets and all. Clearly all of these idiosyncrasies are about saving money on electricity, but they take it to an extent that it doesn't make you feel very welcome or comfortable. Others have said that the bath is quite small and that they couldn't use it in the morning. This isn't a problem for me, as it's often this way in minshuku. The food was good: not any better than we had at other minshuku, but not worse either. However, the dining room is Western-style tables and chairs. I prefer a Japanese-style low table, but you may count the Western arrangement as a pro. Fantastic Original Japanese Experience with Charming Hosts in a Historic Village! Shimosagaya is the most authentic ryokan in Japan with a wonderful host who made our visit an experience of a lifetime! The Inn is magically located in a small village with gorgeous mountains surrounding the post road town near a crystal, clear river that lulls you to sleep at night. The stars above the sky and the lovely evening lanterns appear to be a movie set. The host is the best chef and he will delight you with fresh food from the surrounding, enchanting forest which will engage your senses to the clean and natural environment. You will be immersed by the hosts sincere kindness and warm hospitality. Simply Delightful! I highly recommend Shimosagaya! Pristine accommodations, a darling community ensure you hike the trails of the post road for a journey through time! The location was great! It was easy to find and in a very beautiful town. We received a warm welcome when we arrived. The hosts showed us around and then led us to our room to rest before dinner. The stairs that lead to the rooms were very steep, but we were ok with that (just beware if you are not comfortable with that sort of thing). The room was very clean and comfortable. The only issue with the room was that the walls were very thin so you could hear everything from the other rooms. If you'd like to use the air conditioner or TV, you will need to bring coins (the hosts had coins for us, which was very convenient). The area is fairly high up in elevation, so it was actually pretty cool even in August (and the area is super quiet so leaving the windows open was a good option). The shower was wonderful, but the bath was a bit small. There were two restrooms, one upstairs and one downstairs, both were very clean. The food was different than I'm used to eating, but I really appreciated that it was all local. It was fun to try new food. There isn't much to do in Tsumago at night, but that led to a very peaceful walk around town and an early turn in. This was a nice and peaceful stay. Not all guesthouses are alike nor is the accommodations or food. Shimosagaya has some unique features and your expectations will determine your experience. We thought the food was excellent and the room was comfortable. There is wifi - great, and we didn't want to watch TV, so that didn't matter. Wifi was found at every location on our 3-week extremely varied trip. The location is special as it is across the street from the raging river, it cooled our room in July and was pleasant background noise for sleeping. The stairs to the rooms upstairs is like climbing into the attic, straight up but fun for us. We were greeted and checked in early, I didn't think English was strong with our host but good enough. It was a little shocking to find only one shower to share with up to 10 guests including the hosts. I jumped in upon arrival and was grateful. The house is tricky to find unless you walk down the road across from the river, the path from the town splits and you have to find the "path" to the place. We enjoyed our stay for the night. Food was good, but for the same amount of money we also stayed in a ryokan in Magome where the bathing facilities were much better, the room was twice as big and the staff was much more friendly. Our welcome by a man that also lives in this Ryokan was not friendly and he didn't explane much about the place. They also have crazy small towels were you can only dry you big toe with. In the morning during breakfast they quickly removed the towels so we wouldn't use the shower, but we asked for new ones. Also you have to PAY for the airconditioning!!! We stayed at Shimosagaya for 1 night. It is located in a quiet alley in the beautiful town of Tsumago. The owner was very nice and helpful. The food was delicious. We really enjoyed our stay and hope to go back one day. The host is very friendly and showed us around the place. He speaks English and good enough to communicate. Both husband and wife made us feel warm. The room is nice, clean and comfortable. Food is prepared by the husband and it is delicious with local ingredients. Very homey feeling. The place is a little tricky but not at all difficult to find. It is down a side alley and when we asked one of the shop keeper on the street, they were able to tell us where the ryokan is. Lucky the taxi driver knew where the place was! Excellent location, staff, food, service and the room was perfectly adequate. Plenty to see in the village, great walk to the castle ruins and onsen close by - local bus takes you there. Owner suggested visit to the OK bar in the evening and this was special. Sake tasting as well as beer, stories from the host and recital from host's daughter. It was our first 'traditional' Japan experience. We really enjoyed the food. The room was very comfortable. During the day there was space to drink some tea. In the evening (during the dinner) our futons were prepared. Dinner en breakfast was served in the 'living' and we enjoyed it togehter with the rest of the guests. Which make it a good spot for some conversation with fellow travellers. Lovely stay in March 17. We arrived early & were able to check straight in. Host's friendly but reserved and English not at all good. Food great although very traditional. Rooms lovely although walls very thin so you could hear other guests. Tsumago is beatutiful, like stepping back in time! Great for Nakasendo highway. Would recommend & would book again. We stayed for two nigths at Shimosagaya. The house has dining room, kitchen (hosts only), bathroom where you can take a bath Japanese style between 4-9 PM, all at the ground floor, and guest rooms, toilet and sink at the upper floor. Up to 9-10 guests can be accomodated. There is another, older, adobe house in front, open for everyone to see its ground floor, where the hearth visible in one of the pictures is located. The food is great, dinner time 6 PM and breakfast 7:30 AM, all guests eat together, good way to know the other travelers. The hosts are very kind and helpful, they don't speak much English, but they understand some. Personally I would have liked more interaction with the hosts, but I guess language remained a barrier, so a little Japanese can be at hand. The village is great, too! I fully recommend the Waki-Honjin ancient inn and museum. At Tourist Information Center they have a very useful and detailed hiking brochure with all the Nakasendo trail in the Kiso Valley, do not miss it! The house has dining room and bathroom at ground floor, while the guest rooms, toilet and sink are at the first floor. You can take traditional Japanese bath in the bathtube between 4-9 PM. The house can host up to 9-10 guests. The room is traditional, with tatami and futons. You wil find in the room timetables of buses and trains, to schedule your activities. In front of the house there is an older, adobe house with the hearth you can see in one of the pictures. The meals were great! All the guests are dining together at 6 PM and taking breakfast at 7:30 AM, no exceptions. The hosts were very kind and helpful, they do not speak much English, but they understand some. I personally would have liked more interaction with the hosts, but I guess language was a barrier, so a little Japanese can be at hand. The village is great, too! I fully recommend the Waki-Honjin inn and museum. And very helpful and detailed hiking brochure at the Tourist Information Center, do not miss it! Our stay at Shimosagaya in Tsumago was a real highlight of the trip. We hired a car in Nagarno and the drive through the Kiso Valley to Tsumago was also really enjoyable experience. 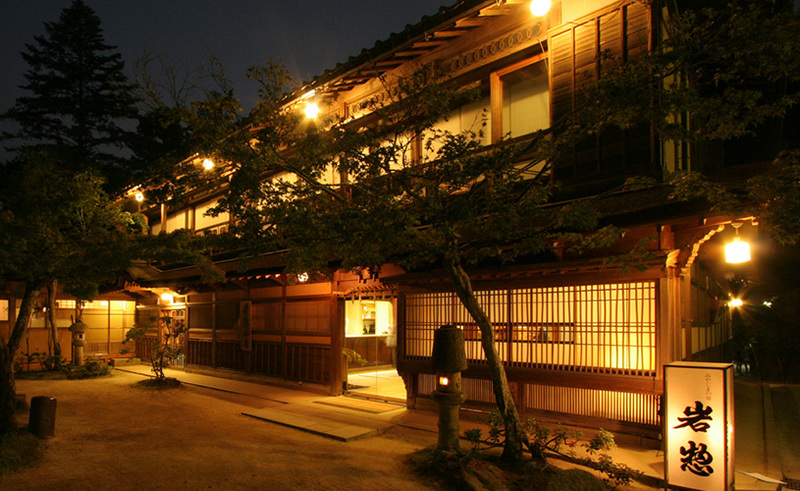 Shimosagaya was a very nice place to stay and so conveniently located within the central area of the village. Our room was comfortable and warm and as had been anticipated the home cooked meals were excellent and so well presented. Our hosts were also able to provide undercover car parking located nearby. Also I must say the Japanese Guest Houses reservation service was excellent. The recommendation of Shimosagaya after our inital inquiry was unavailable was a fantastic outcome. I certainly have no hesitation in recommending this web-site to friends who may be travelling to Japan in the future. It's such a treat when you are traveling and you are informed there is a Parade through town the next day when you arrive. Easy to find on the main street, the entrance is down a narrow alley. Simple accommodations with spectacular meals. The family that runs this spot spends the days posing in the street front rooms for all the local tourists. Great place to start your Nakasen-do trail hike, we went to Magome after the parade. This was indeed also the least of my stays in Japan. The hostess was down right rude and in one instance when I queried her why booking thru Japanese Guest Houses it was more expensive she starting yelling at me in Japanese and pointing her finger in my face. Totally not what I had experienced anywhere else in Japan. My one person's room was small; the bathroom was small and guests were not allowed to use the showers in the morning; no proper hot tub but just a bath and it felt like you were taking a bath in some one else's bath water. Then having to pay for TV, air-conditioning and heating was a first for me in Japan. And at prices of $100 per night for me, this was ridiculous. Then to top it off the sheet on the bed was half size. Like the owners had cut the sheets in 2 to make them go further. I felt the owners were trying to short change the guests in every possible way. Small face towel, I can go on and on about this place. The hosts clearly do not like foreign tourists, even though we were the only ones staying in the place. EXTREMELY DISAPPOINTING. I can still get upset thinking about this place. My experience there caused me to cancel some other ryokans that I was booked in for the rest of my trip. I decided to stay in small business hotels where were so clean. Oh yes didn't mention that the hairs on the sheet from the person who slept on them last. Don't stay here. Save your money for a nicer place. First of all, Japanese Guest Houses service is excellent. It works very well and would recommend this service to friends who are looking for accommodation in Japan. Now for Shimosagaya: Our stay in Shimosagaya was very good. It did not disappoint us in any way. The facilities were as we expected to be. We got a free undercover parking for our car. The location is right in the middle of the lovely Tsumago. Food was excellent, well prepared and plenty. There were little interaction with the host(s) though. They were not unfriendly at all. They are just very reserved. (Btw, I can speak a little Japanese) Just a little note: Their check out time is 9:00 AM - quite early compared to all the different accommodations we tried in Central Honshu. We hiked from Magome to Tsumago before spending a night at Shimosagaya. I cannot recommend this walk and spending a night in Tsumago enough. The walk - pleasant, easy, relaxed, nice sights. Tsumago- busy during the day but when everyone leaves at 5 it is amazing. Shimosagaya is in the heart of Tsumago and the owners are very polite and helpful. Large rooms, comfy futons and good food. Plus it is a few houses down from the ONLY pub/inn that is open after 5pm. Go there! Highlight of our trip. Our hosts were very hospitable, polite, accommodating and efficient. The best of Japanese hospitality! Communication wasn\'t a problem as they knew how to look after us without being asked and there were some signs in English to explain away any confusions. The place was neat and clean and the futons were quite comfortable. We were travelling with three generations and my parents (senior age range - I\'m not allowed to tell you exactly how old they are) said they were the most comfortable futons of the trip. The food was delicious - definitely one of the best meals of the trip. The stairs are quite steep up to the rooms - it wasn\'t a problem for our party, but if you have anyone with mobility problems just be aware. We kept the doors shut to the rooms so it didn\'t bother us with the kids. We also had plenty of adults to supervise them. We got a bit lost on the way in, so I\'ve attached some photos to make it easier to find. Look down near my husband and daughter to see the sign in the second picture. We were also pleased with the booking service through Japanese Guest Houses, which was efficient and contained all the relevant details (and a map - we managed to get lost anyway). Good ryokan, clean rooms, friendly but reserved staff. Very early check out time, 9 am, before the shops are open. At Shimosagaya the dinner and Breakfast were first class. The room was nice too. It was a little odd that Air con or TV were coin operated (100 yen, not $100 as another reviewer wrote). The stairs upstairs are very steep which may be an issue for older people. The daughter gave me an initial tour of Shimosagaya and at the end I thought she was showing me downstairs, so I followed her into the living area and she turned around & saw me & gave a little scream- it was very weird. I got a slight feeling her & the mother weren't overly fond of foreigners but the man was very nice. Tsumago was beautiful although there were more tourists there than I expected. But after 4pm,5pm everyone suddenly vanished and there was no one on the streets! We have stayed in Shimosagaya for two nights. It is situated in a quiet alley. Very close to all the beautiful sights in Tsumago and without the noise such a beautiful place gives. The owners were very friendly. While I was a bit ill, they helped me get better, supplying healthy and delicious food and medicine. The area is very green, the atmosphere good, the house is lovely and the view on the river lovely. We had a delightful stay here. After walking the Nasakendo Way for 7.8 kms it was lovely to check into yo our comfortable tatami mat room. Really enjoyed the shower room and shared hot bath which is kept deliciously hot by a slatted cover. (As you wash yourself scrupulously clean before you get in the bath the water stays clean.) the stairs are steep and narrow so it is better for agile people whose bags are not too big. Meals were delicious and a work of art. Tip: read the bus timetable carefully for catching a bus on to Ngasio! Outside peak times some do not run. Thoroughly recommend this place. 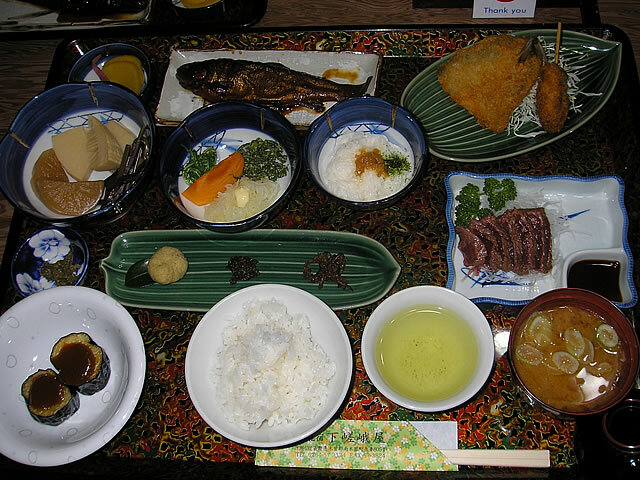 Very good Japanese breakfast and dinner served in dining room. Little English spoken by mother, father, daughter. Could leave luggage there before 3pm checkin. First ryokan that did not provide slippers. Bath only large enough for 1 person. I thought this ryokan was overpriced, but a nice, comfortable place to stay. Do visit Goto's pub a few doors up and open to 8pm. He's a very interesting guy. Restaurants pretty scarce. Most places are coffee and sweets shops. Great to walk around at night when lanterns are lit and early morning before tourists arrive. The town is really old Japan and very unique. If you leave on the 11 am train back to Nagano there is no bus to the station. You will have to take a cab for 1500 yen. Tsumago is really small, so, finding the ryokan was easy. The personal is very friendly but they don't speak english. We didn't like much the traditional food so, for breakfast we asked if we can have some toast and coffee and they did it, we really appreciate that. The place it self is ok... we thought it was quite expensive for what it was... the futon bed were too thin, we had to share the bathroom, if we wanted to see tv we had to pay, and for the air conditioning too, no internet either. We booked two nights but only stayed one, not for the hotel but for the place, there was nothing to do, so, we sleep, had breakfast and left walking the 8km to the other place. I stayed in Shimosagaya for 1 night in November. To be honest, I'm not sure I would have found the inn if my taxi driver hadn't pointed it out, as Shimosagaya's entrance is located inside an alleyway. But once inside, I found the inn to be clean, comfortable, the hosts friendly and helpful. Best of all, the food is delicious. The host gave us a very warm welcome upon our arrival. We arrived early but she let us check in anyway. Very friendly and runs by husband and wife. The husband cooks our meals and the wife made our room. She always greets us with a smile on her face and made us feel like home.